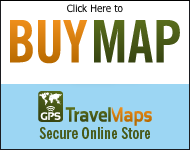 GPSTravelMaps.com: Brazilian Adventures—Take Your Pick! The Amazon Rainforest is the world’s largest, and it’s also home to the planet’s most massive river system. The Amazon River itself is huge and is able to accommodate larger ships, making it a popular destination for luxurious “river cruises” that still provide a window into the natural beauty of the jungle ecosystem. For a true adventure, however, take the opportunity to explore some of the river’s tributaries in smaller vessels or even a traditional dugout canoe. In doing so, you’ll get up close and personal with the flora and fauna of both the river and the forest and you may even experience a chance encounter with one of the region’s many still-thriving indigenous tribes. Just because Brazil is renowned for its rainforest doesn’t mean you have to leave the city for an adventure. Rio de Janeiro, one of the most exotic cities in the world, is cosmopolitan in every way, but it’s also surrounded by natural features stunning enough that they alone would make the city an attractive destination. Within the boundaries of Rio de Janeiro itself, go cycling. Go surfing or scuba diving off the city’s beach. And, in the surrounding mountains, try hang-gliding, paragliding, or simply take a hike. On Brazil’s southwestern border sit the Iguaçu Falls, some of the most impressive waterfalls found anywhere in the world. Though most of the falls are technically on the Argentinian side, this means that Brazil has the superior view! Companies located on the Brazilian side offer helicopter tours to visitors who want to get up close and personal, so if this sounds like an adventure you’d like to take we highly recommend it. Pick up our Brazil map. This GPS map will give you turn by turn directions to your destination using a point of interest (POI), city point, and/or latitude and longitude, with the ability to preplan driving destinations before getting into your car. Screen Capture from our Brazil GPS Map.